United States President Donald Trump has said he believes the death of Saudi dissident journalist Jamal Khashoggi was the result of a "plot gone awry," and that he opposes ending the USD 110 billion mega arms deal with Riyadh over the issue. 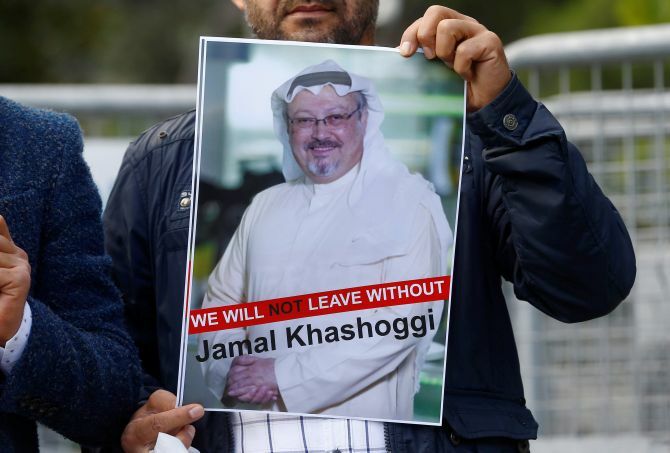 Khashoggi, a columnist for The Washington Post, was killed inside the Saudi consulate in Istanbul on October 2. The Saudi government initially said he left the consulate through the back door. Following a global outrage, the Saudi government on Friday in a statement acknowledged that Khashoggi was killed in a fistfight inside the consulate and noted that an interrogation went wrong. Turkish officials have said they have evidence Khashoggi was tortured, dismembered and murdered inside the consulate. US President Donald Trump has said he was "not satisfied" with the response of Riyadh over Khashoggi's death. The president also said a group of US officials are in Saudi Arabia and another group of investigators in Turkey are trying to gather information on this issue. "I am not satisfied with what I've heard," Trump told reporters at the White House before leaving for an election rally in Texas Monday. "We will know very soon. We have tremendously talented people very well. They're coming back tonight or tomorrow and I will know very soon," he said responding to a question. He also said that Saudi Crown Prince Mohammed bin Salman has told him that neither he nor the king were involved in this. "He (Crown Prince) says he is not involved nor is the king," Trump told USA Today, a popular American daily, in an interview. If their involvement was proven, "I would be very upset about it. We'll have to see", the president said. Trump, who has said he wants to get to the bottom of the case, told the daily that he still believed it was "a plot gone awry". He reiterated that he would oppose efforts to cease arms sales to the kingdom. Over the past few days, Trump has spoken with the Saudi prince and Turkish President Tayyip Erdogan. More details of the incident would be known in a day or two, the US president said. Responding to questions, Trump said he was against making any move on the USD 110 billion mega arms deal with the Saudis. "I don't want to lose all of that investment that's being made in our country. I don't want to lose a million jobs, I don't want to lose USD110 billion in terms of investment, but it's really USD450 billion … So that's very important," he said. "In weighing the merits of US-Saudi military cooperation, it is imperative that Members of Congress have a full, detailed grasp of the intelligence community's knowledge of Saudi actions and their potentially harmful impact on the wellbeing of US residents and citizens, as well as any US intelligence failures pertaining to Saudi activities that may have contributed to needless loss of life," the letter to Coats said. Senator Tim Kaine, a member of the senate foreign relations and armed services committees, said Saudi Arabia's alleged murder of Khashoggi while visiting its consulate in Istanbul "demonstrates a combination of brutality and lies" that must not be tolerated.